“The typical attitude of Saddleback staff as they start work each day.” This was the caption included with the picture (shown left) of a woman representing the Red Guard, which has been associated with crimes against humanity to include the murder of millions of Chinese people under the leadership of Mao. A recent Facebook post meant to positively describe the staff at Saddleback Church by Rick Warren , who serves as pastor, has some persons wondering about its purpose and what really drove Warren to post it. Others have attempted to explain to him and those who have come to his defense the history of trauma, oppression and suffering that persons have experienced at the hands of the Red Guard. Consequently, Warren has taken down the offensive and culturally insensitive post, commenting that it was only a joke. But, there is nothing funny about it and Christians must be more intentional about the language and images that we use when discussing the Church, its servants and mission. 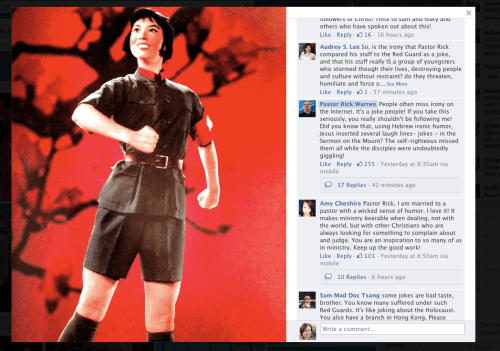 Kate Shellnut, Why Rick Warren’s Facebook Photo Angered Asian American Christians, Christianity Today, September 26, 2013.